POY Milanese Loop Stainless Steel Bracelet Smart Watch Strap is Scratch-Resistant, Not Deformed & Not Fade. 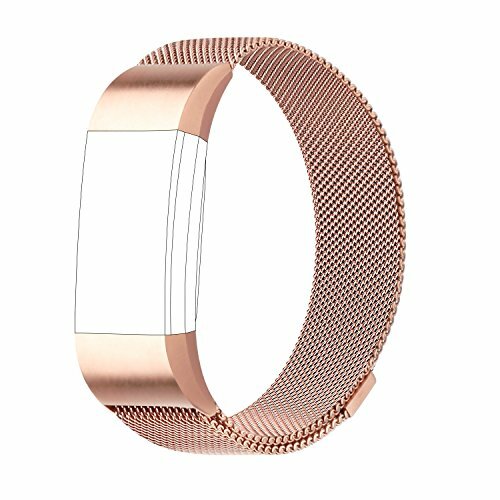 Woven stainless steel mesh makes the watchband keep ventilated, never remain sweat. 1. If there are any stains on the surface, please wipe it with a soft & wet cloth. 2. If there are any stains in the gap, please brush it with a soft hairbrush. Note: You'd better not to soak the Milanese Stainless Steel Watch Strap in the water directly & Do not use firm toothbrush to brush it too hard. Any dissatisfaction is 1 year guaranteed with a replacement or full refund. We checked all the items carefully before the shipping, however, it might be broken during the transport. If you receive a defective band or meet any other problems, please feel free to contact us, we will give you a satisfactory reply within 24 hours. Unique magnet clasp design - Strong magnetic closure automatically stick and lock to another end of the band for fitbit charge 2, no buckle needed. Ensure your watch be secure.